It’s hard to improve upon perfection. The original Day One made keeping a journal on your Mac easy and fun. Day One 2 wants to do even more, but to fulfill those ambitions, it’s partly sacrificed the original’s beautifully simple design. Day One 2 (at right) isn’t quite as stylish and appealing as the original version (at left), but still offers a clean, eye-catching interface. It’s still a snap to start typing a new entry in Day One 2, either from the app itself or its convenient menu bar widget. The latter also provides customizable reminders to write down your thoughts at a given time. Day One 2 tags entries with the date, time, any custom tags you care to create, the current weather, and your GPS-based location. Don’t want your journal knowing too much about you? You can deactivate location info when crafting a new entry. Don’t want anyone else reading your journal? A password-lock feature will keep it safe from prying eyes. Day One 2 adds the ability to keep up to ten separate, color-coded journals at once; for example one to serve as your personal diary, another for business notes, and a third to jot down ideas for that novel you’ve been planning. And where its predecessor only allowed a single photo per entry, Day One 2 supports up to ten, dragged and dropped from Photos, Safari, or the Finder. Paste in a YouTube or Vimeo URL to embed that video in your finished entry, as well. 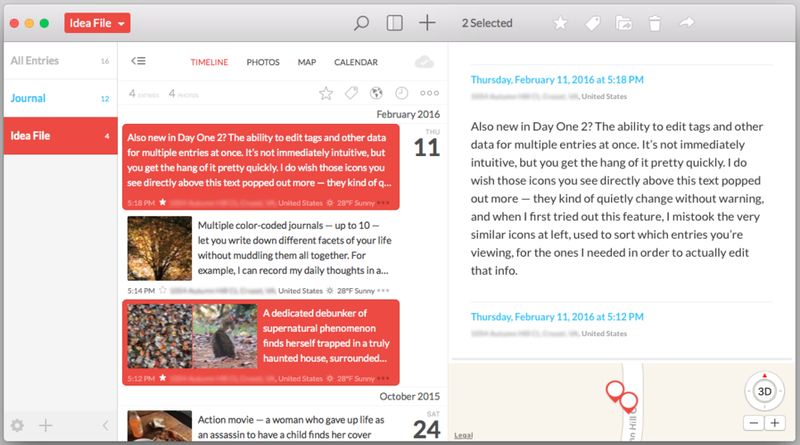 Day One 2 adds support for multiple journals and a photo-based timeline view of your journal entries. To accommodate these new features, Day One 2 sprawls across greater screen space, stuffed with more, smaller icons. While Bloom Built has clearly worked to keep the interface clean and appealing, it’s definitely more cluttered than its predecessor’s. Figuring out each of the many new buttons remains fairly easy, but still not as easy as in the old version. Editing multiple entries particularly threw me, until I spotted a series of related icons that quietly showed up in an unexpected corner of the window. Also new in Day One 2: The ability to select and edit multiple entries simultaneously. 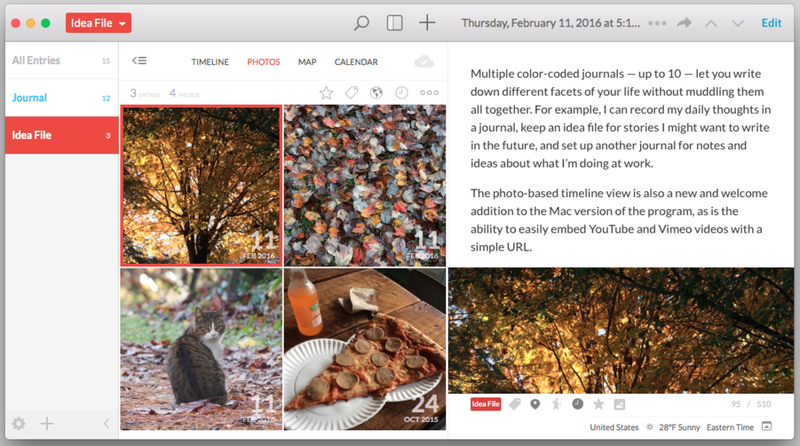 Version 1 relied on Dropbox or iCloud to sync journal entries across its Mac and iOS iterations, but version 2 uses Day One Sync, Bloom Built’s own free, proprietary system. This has alarmed some iCloud-loving users, but Bloom Built argues that the new service works better, faster, and more securely than either of the old solutions. I had trouble getting Dropbox to work with the original Day One, but I have no such complaints about Day One Sync. Setting up an account took mere minutes, and synching entries between my Mac and iPad happened almost instantly. Though any data you sync via Day One’s system is already securely encrypted, Bloom Built says it’s planning to add even stronger private key encryption in the months ahead. 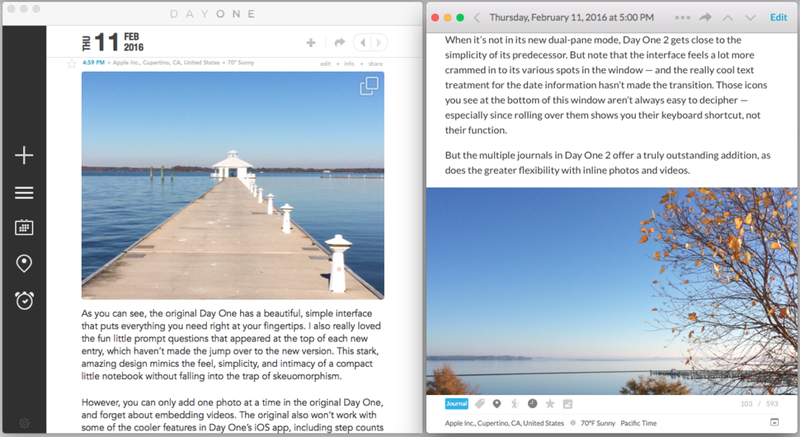 Day One 2 also temporarily lacks its predecessor’s Publish feature, which automatically turned entries into blog pages, although Bloom Built says it’s rethinking that ability, and will add it in a future update. I can see how Day One 2 might evolve into a powerful online publishing platform, especially if its makers keep their other on-the-horizon promises of stronger social media integration and the ability to turn your journal entries into a printed book. 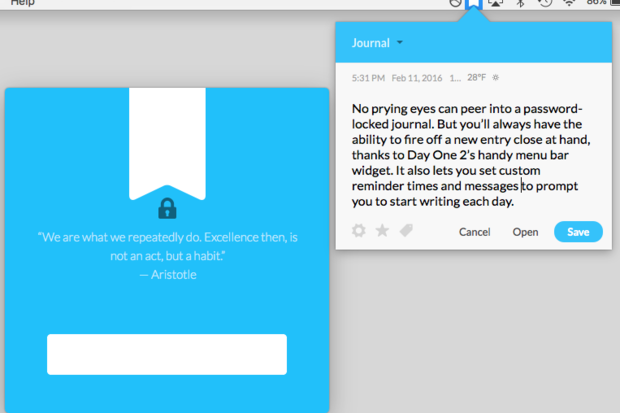 A password lock keeps your journal secure while a menu bar widget makes it easy to fire off a new entry without even opening the program. In my tests, Day One 2 offered speedy searching, excellent online help files, and responsive, bug-free performance. It’s become slightly more complicated than its predecessor and it costs four times as much. But this superb journaling app remains pleasant to behold, easy to use, and a tough act for any rival to follow.